A much better combination of annual and monthly flying stars in May 2017 although there is some very important advice that you must follow this month. We have a few inauspicious Flying Stars grouped in different sectors this month and the annual Cures are very much needed to settle the menacing influence that this can bring. With the Annual #2 Flying Star and the visiting monthly #8 Flying Star in the centre in May, these are two earth stars, one good and other not so. North – A lovely sector for couples as this is a good area for building relationships in love and career. New relationships or even a new job may also be a possibility when under this influence of the month. This is also a good sector for those who are preparing for exams. If your bedroom is in this corner of the house, place something blue, e.g. throw over, rug etc, in the south corner of the bedroom. You can also place if you have them a pair of Mandarin Ducks to enhance romance. Avoid fire colours like red, pink, purple, orange, lilac etc in this area and also avoid candles at all costs. Northeast – A very inauspicious combination and needs either cures or avoidance this month in this area otherwise it can cause many problems. 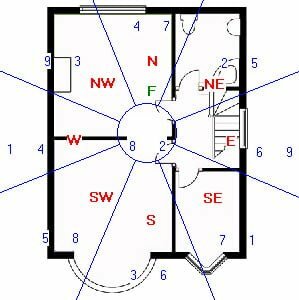 If your bedroom, office, lounge, main door or other important room is located in this area and you are unable to move out please read this section carefully. Stillness together with metal cures can keep its negative influences at bay and you must avoid using fire energy like reds and candles in this area this month. You should place a set of six Chinese coins tied with red ribbon and also place more metal decorative Avoid red objects, bright lights, candles or red coloured furnishing this month. Do not worry if you have these colours already just introduce colours white, silver, gold or copper in the way of a floor mat, cushions, throws, tablecloth or such like. You can also use dark blue or black if you prefer. East – Ch’ien 6 White The star of Heaven star (Wu Qu) is a compassionate money star and a yang Trigram and it can affect the lungs, large intestines and head and can impact the Patriarch (eldest male) although on the whole it is considered an auspicious star. Those with a main door, office/study in this area will benefit greatly this month although the intensity of these characteristics will differ in varying degrees according to the influence of the land formations around your home and obviously something we are unable to analyse. If this is your bedroom, a shade of blue or black in your furnishing or décor may help with health. A blue painting (not water scene) may also do. Place a set of six coins in a row in this area; these are very traditional and powerful cures. Southeast – Tui 7 Red (Po Jun) robbery star is a metal star and a yin trigram and known as the mischievous Po Jun #7 argumentative red star is a negative influence in Period 8. The trigram Tui is also known as ’Broken Soldier’. This is a fighting star which can cause problems if left alone, the #7 Red indicates a high risk of burglary, deception, copyright theft, gossip and back stabbing this month. Take extra security measures especially if you have a front, back or side door in this sector. Make sure doors and windows are fastened securely before leaving the house. Do not display valuable items on windowsills, which may attract the interests of passers-by. South – Chen 3 Jade (Lu Cun Xing) is a wood star and a yang Trigram. It affects the feet, lungs, convulsions, liver, bladder, limbs and hysteria. It also affects the eldest son and overall very inauspicious and needs cures or avoidance this month in this area otherwise it can cause many problems. To remedy its effects this month use red decorative objects, candles, lamps and lights. A nice simple cure is a red, pink, purple, burgundy (fire colour) floor mat or a table lamp with a red shade. Do not use metal (metal colour is ok) to control this energy. Avoid any form of noisy renovations or re-decorative work in this part of your house or office this month. Nor should you disturb the ground by digging, building foundations or conduct any maintenance work with any noisy equipment in this area inside or outside your property or garden this month. To calm interactions you should place a light in this area if you have a choice, a lamp with a wooden stand and a peach/red shade is better. Do not hang wind chimes of any material in this area this month, especially metal wind chimes as it will worsen matters. If you have been advised by a professional Practitioner or our main software flying star section advises you to hang a wind chime, this is fine. Southwest – The 5 Yellow (Lian Zhen) star of tragedy is located in this area this month. It affects the overall luck, virtually all types of illness including many mind related problems with regards to thought process, lack of energy and procrastination. It will not affect anyone in particular in the home as the #5 star does not have a trigram and no yin or yang energy so to speak and this is why the negative aspects of this star are so strong. Summary: Do not activate this area with loud noises this month, keep area quiet and avoid at all costs building work or refurbishment. Do not use the fire element or colours red, pink or purple. Keep doors closed. Place a set of six coins tied with red ribbon here along with metal ornaments. Use colours white, silver, gold or copper. I will repeat this part, as it is so important, please keep this area of your home or office as quiet as possible this month, avoid redecoration and building work in this part of your home or office. West – Kan 1 White Kan (Tang Lang) is a water element and a yang Trigram. In the physical body it is the ear. Internal organ it is the kidneys and it is also blood. It also affects wealth career and luck and because it is timely in period 8 (2004 – 2024) it is considered an auspicious flying star. This area can be very good for relationships this month and to enhance you should introduce some metal elements that are round in shape, a traditional enhancer and cure is a brass wu lou or any object that is round in shape and made from a good quality metal like brass copper, steel. Avoid having large quartz crystals (over 4 inches in size) in this area this month however, if the flying star general advice suggests you to place quartz crystals this is more important to follow. If you activate this area with the annual enhancers this month it can bring in new opportunities, gains in financial investments, academic achievements and also romance and relationships as peach blossom is very good here. If this area is a bedroom, office, study lounge or other important room you should place a set of six Chinese i-ching coins tied with red ribbon. This is a very traditional and authentic enhancer for the #1 flying star. Blues, black, grey or charcoal would be a good colour scheme for this room. You can introduce these colours in beddings, throws, lampshades, pillow covers etc. Northwest – Li 9 Purple (You Bi) Li 9 Purple is a fire star and a yin trigram and considered a star of future wealth and has an auspicious influence in Period 8. Career opportunities and promotions are probable especially if you have an office or main door in this area this month. Whilst we have an auspicious monthly star, the annual #3 star is not so good and If you disturb this area this month you may cause problems for the middle daughter and it could affect heart, stomach or blood related. If you have any poison arrows like lamp post, pylons or large comers of house pointing toward this area consider hanging a flat ba gua mirror outside pointing toward the offending object. Generally though there is nothing to worry about with the #9 star as it is it is timely and an auspicious star. Centre – Ken 8 White Zuo Fu is an earth star and a yang Trigram and is the most auspicious governing flying star of the lower era of the sexagenarian cycle of the flying stars (Xuan Kong) system which is period 8 (2004 – 2024). It affects the hands, fingers, pancreas and back. It also affects wealth career and luck and because it is timely in period 8 (2004 – 2024) it is considered the most auspicious flying star.